Healthy snacking can sometimes be a difficult, especially when you have a Salisburys or a Tesco popping up everywhere in a half a mile radius. You go on for fruits and nuts and you come out with a tube of Pringles and packet of KitKats. Healthy snacking does not have to be boring! Here are the things I think that work very well together: fresh/dried fruits, nuts, seeds and dark chocolate. Dark chocolate is one treat you can indulge in, its sugar, fat and carbohydrates content is minimal compared to milk or white chocolate and it is rich in anti-oxidants! 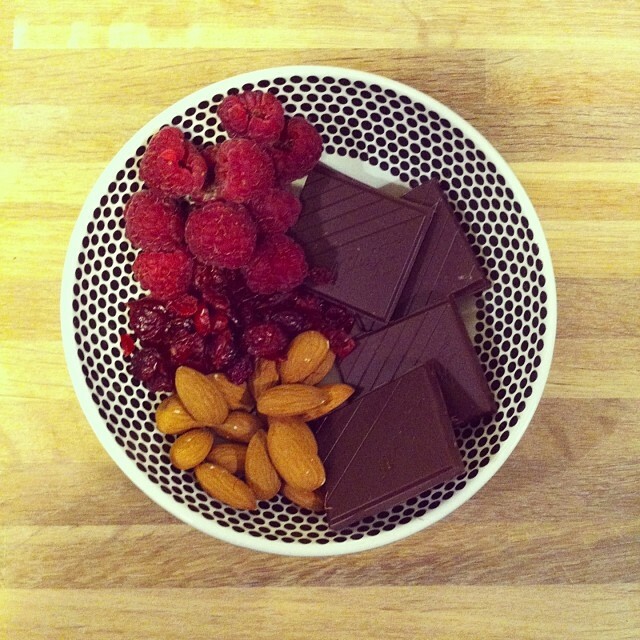 The above plate, courtesy of Google images, contains raspberries, cranberries, almonds and dark chocolate! Yum!